Each individual bedroom ensuite is treated with a different style, colour palette or lighting, to suit the preference of each user. Kart Group creates personalised interior spaces for clients that reflect and talk about who they are. Since 2005, the Dubai-based design firm has been creating these lasting impressions in hotels, restaurants, residential villas, commercial projects, showrooms and especially government offices. It has also been implementing unique and personalised artworks within its projects by working closely with customers to deliver the most successful space solutions. “We invest in relationships to help us get closer to solutions that speak our clients’ language,” managing director and senior architect Mustafa Khamash tells Gulf Construction. Each bedroom suite has a unique theme. “We see a need from our clients to strongly reveal through their interiors, their identity from a cultural heritage perspective: an interior that reflects and talks about who they are, and how they contribute to the development in the region in the case of corporate offices,” he adds. One ongoing project that exemplifies its business ethos is a private beach house which is currently under construction in the Gulf. The 14,000-sq-ft project is in the structural construction phase and is expected to be complete by mid-2019. 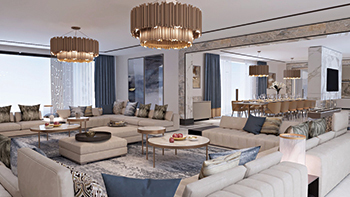 Design work on the luxury project started in July 2017. The building will encompass a main majlis, a 14-seater dining room, a 14-seater living room, six ensuite bedrooms, three washrooms, a master bedroom, dressing room, massage room, and outdoor bath. The beach house uses the modern interior design codes of the hospitality style, with the six bedrooms interpreted as individual hotel bedroom ensuites. 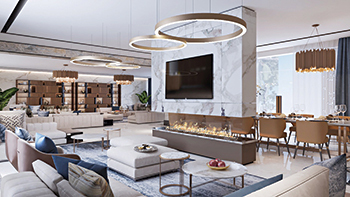 Commenting on the client’s brief on the project, Khamash says the owner desired a modern interior design, like a boutique hotel – featuring bedroom suites, each with a unique ambiance and theme. The main majlis features two comfortable ivory C-shaped modular sofas, symmetrically facing each other. The floor layout opens into a majestic U-shaped stairway, which leads to a spacious main majlis. It faces an open space comprising a 14-seater dining area connected to the living room by a ceiling-mounted electric chimney, and a U-shaped American kitchen. Passing these areas, a long corridor serves a succession of bedroom suites sharing a similar layout – each however with a different design theme. The main majlis features two comfortable ivory C-shaped modular sofas, symmetrically facing each other. A composition of circular round tables and ottomans offers extra seats to host a large number of guests. The furniture is set on a bespoke floor rug representing a sea foam of blue and powdery tones, contextualising the beach house in its natural surrounding environment, Khamash points out. The dining and living rooms are separated by the main majlis and kitchen with architraves designed like portals, underlining a thick frame of special fantasy light brown granite imported from Italy, creating a beautiful transition effect. The internal sides are cladded with white carrara marble slabs, matching the ceiling-mounted TV panel. Noble materials are combined with brass and bronze metals, yellow and blue upholstery, and a stylish screen-printed pattern on the glass wall partition. A highlight of the beach house is an impressive ceiling-mounted TV panel, which embraces a floor-mounted electric fireplace. “Each individual bedroom ensuite is treated with a different style, colour palette or lighting, to suit the preference of each guest. The furniture is elegant and comfortable, with a subtle use of accessories and artworks, making the ambiance of this beach villa relaxing and very personal,” Khamash explains. 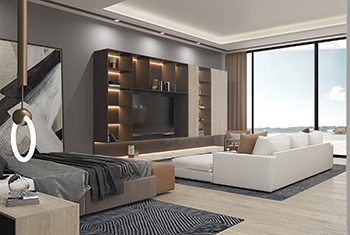 A highlight of the design is the impressive ceiling-mounted TV, which embraces a floor-mounted electric fireplace sporting Carrara marble cladding and a matt bronze lacquered aluminium base. For the colour scheme, a white and beige base was selected, highlighted with warm brass and bronze metallic elements, and blues and yellow accents in the upholsteries. 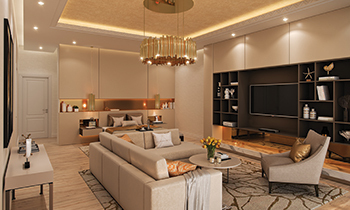 Kart Group also provided its expertise in Feng Shui interior design consultancy for the project. Kart Group, a luxury design atelier and UAE importer of fine furniture, lighting, accessories and artwork for unique interiors, is an interiors specialist in modern and contemporary design with a particular focus on bespoke furniture. Its objective is to be the region’s trusted design partner by working closely with its customers to deliver successful space solutions. “Kart Group’s design team, certified by the Italian Architect Association, has expertise in many disciplines, enabling it to integrate all aspects of a project’s requirements into one comprehensive solution,” says Khamash, who has become a well-known figure and the personal advisor in terms of interior design and decor to many esteemed government entities and leaders. The boutique firm has an impressive VVIP client portfolio, primarily from the government and private sectors. Its main projects have been commissioned for government offices (mainly Emirates Towers) and residential villas as well as for private sector offices including oil and gas companies. These include the Executive Office Level 51, the Prime Minister’s Office, the Public Diplomacy Office, and the Ministry of Cabinet Affairs and the Future at the Emirates Towers, in addition to ministerial palaces. Other current assignments include a farm villa for a reputable family in Dubai and the V Space offices at the Emirates Towers, a sub-entity of The Prime Minister’s Office.